This modified messenger bag is knitted-in-the-round has a smaller flap than the messenger bag. A charming I-cord buttonhole loop secures the flap. 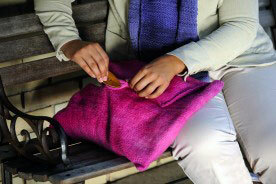 You can vary it by knitting a buttonhole into the bottom edge of the flap instead of using the loop. Using the size US #10, 24″ circular needle, cast on 150 stitches (sts) and join round. Be careful not to twist the stitches. Knit until piece measures 14 inches, and then bind off 100 stitches. Continue knitting on the remaining 50 stitches until piece measure 5 inches from bound off edge to needles; and then bind off 23 stitches. This 5-inch section creates the flap. Slip the next 4 sts onto one dpn and knit 3 inches of I-cord. Leave the remaining 23 stitches on your circular needle. Make sure the I-cord is long enough to go around your button of choice to allow easy buttoning and unbuttoning. Bind off next three stitches of the I-cord, leaving one stitch remaining. Place the one remaining stitch of the I-cord back on your circular needle with the remaining 23 stitches. Now you have a total of 24 sts. Bind off the remaining 24 stitches. Seam the bottom of bag closed. Sew on the strap and/or button(s).